The Iridium satellite phone was picked up on the first ring. “Nam?” the man answered in his native language. For a moment he was confused as to where he was and who he was talking to. “It is a Gulfstream V. The paint job is gray but there are no commercial labels or official seals. The tail number is N44982,” the caller told him. “Good work Arturo,” the Arab thanked him while committing the information to memory. The Mexican intelligence official had become his go between with the Jimenez cartel and himself. It was now clear that the CIA would be of no use to them. They were perfectly happy to see the Jimenez cartel liquidated. The Arab worked for vested interests who were determined to ensure that this never happened. If Jimenez went down, there was no telling how many of the drug corridors would collapse if the American set off some kind of domino effect. They had to nip this problem in the bud. The Arab smiled. He was good at troubleshooting these types of problems. Fear clenched the Arab’s gut. On one hand if the Mexican Air Force shot down the jet it would save him the trouble, the job would be complete. On the other hand, he would be stuck with seven mad men that he would need to find a way to get rid of. The Arab terminated the call and set the phone down. In the muffled interior of the garage he could hear his seven charges initiating their prayers. The chants to Allah reverberated off the walls, filling the garage with their religious incantations. The Arab winced, his fingers tracing the thick scar tissue on his forearm. In the Caribbean heat it felt like the scars were tightening up on him. Soon it would be time for more plastic surgery to relieve the pain. The scars were a constant reminder of who he had been in a past life. The Arab packed away his satellite phone and edged around the side of the Toyota van towards the prostrated Muslim extremists. Really looking forward to this installment. I think you addressed before who will be back and who will not, but after re-reading Reflexive Fire (since there’s no new book available…), will Kurt, Pat, Chuck, and Korgan all return? I think Frank was mentioned in your last excerpt when the informants get rolled? RF obviously left a tremendous amount of open leads for future exploitation. Will we see Leviathan come up again in the future? The triumvirate stashed “caches” of weapons around the world, does Deckard now know where they are to take advantage of them? At one point there is mention of “3 other groups, as well as ones in China and Japan.” What are those guys doing? WE WANT ANSWERS! AND A NEW BOOK! Keep up the great work. Frank, Kurt, Pat, and Korgan will all be back. Chuck lives! …but he is still in the hospital recovering as of Target Deck. Frank is in the picture but is mostly pulling support details in the rear because he is still on crutches and meds from the end of Reflexive Fire. There will also be a couple new characters including a hacker named Cody who was eluded to in Reflexive Fire. Nikita is also back, doing what he does, mostly with a HK 417. Another new character is Aghassi, an Iranian American recruited into ISA. I did intentionally leave some loose threads, Deckard only saw one piece of what was a much bigger picture. Leviathan is a off shoot of stuff you read about in the PROMIS series, that underground cache will come back in some shape or form, I don’t doubt that. Deckard knows nothing of this, but god help us if some of the bad guys uncover that cache in some future book… I have some other plans for future books, I think book 3 will be set in India and involve GMO’s. After that I will have some decisions to make about the future of this series. There is a lot of plots I can write about stuff that is very real but I don’t think I will ever be able to prove so I might as well use it as a novel. Just when it was safe to go back into…. Great excerpt Jack – awesome news that it is in edit, could use some Deckard! John, I think this book will be hard hitting. The first half of the book will take you into the situation in Mexico with the cartels which will be a shocker for the average joe (not so much for most of my readers) but when Deckard wraps that up this is where any other novel in this genre would end. That is where this book kicks into high gear. The second half of the book goes into uncharted territory that I think will result in some sleepless nights for some readers. Dang Jack – I look forward to the challenge. You have definitely helped me expand my knowledge base through your fiction and non-fiction suggestions. There are some very interesting alliances or an interesting nexus of interests in this book. I’m really looking forward to this novel. One of the things I like about RF are all the detailed descriptions and references of the equipment the characters used. I’m thinking of just putting in URL links for the kindle book so people can check out what I’m talking about as they are reading. I’ve seen hyper-linking in some other books, but normally it’s to something like Wikipedia. I think that can be a good source, but it can also be over used (this was a primer, where every city was basically linked to its profile). But I do believe that authors can do a lot more with the capabilities of modern e-readers. what is your guess as to when this book will be done? and what book are you going to be working on next? any Promis books? 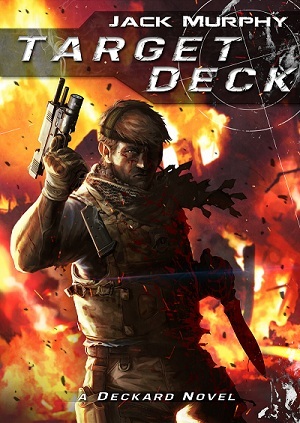 I hope to have Target Deck out by Christmas. After that my next project will be PROMIS: Lebanon.